Hello! *wave* I am entering the blogosphere, and I hope you'll enjoy my tardy foray into blogging. 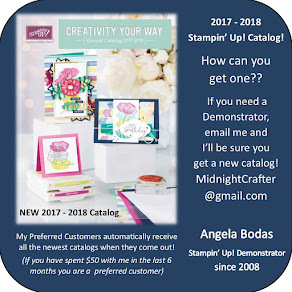 My name is Angela, and I have been a Stampin' Up! hobby demonstrator for just over 6 months but a crafter of sorts for over 15 years. 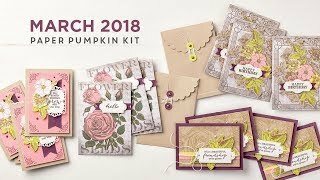 One of the things I LOVE about Stamping Up is that I can watch how thousands of people take a single stamp or concept and work it into different and fabulous crafts - building on each others ideas, blending the best of many, and teaching others how to create their own versions of ADORable. The Statement of the Heart really speaks to me: To love what we do, and share what we love as we help others enjoy creativity and worthwhile accomplishments, in this we make a difference! I am intrigued with the idea of remixing craft ideas I love from the world wide web with my Stampin' Up! materials, and achieving my own brand of Cute. 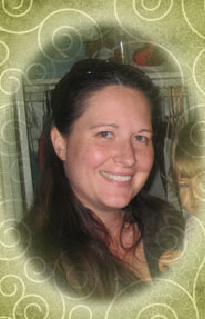 As the mother of two kids under the age of 4 (kiss kiss - bubby & "me too"), and working full time to boot, I do not have hours and hours of creative time! In fact, most of my crafting is done at the prime time of 9:30pm and 1am! (thus MidnightCrafter) But... I do get such satisfaction in MAKING paper crafts, and in searching out the unique and WOW items, learning new techniques and skills, and seeing the joy on someones face when they realize that they ARE crafty! I thought there might be others out there : looking for a few good ideas! So join me, as I hope to showcase some fabulous finds, and share with you my love of making some darn cute stuff!! Happy Crafting! Excellent start! Keep up the good work!